I am seriously hooked on pot melts ( which bits and pieces of glass are melted and allowed to ooze out from a container to create random patterns). These pieces of glass were "liberated" from the scrap bin at Snow Farm. Fused glass students make all these fascinating pot melts and throw out quite a bit of glass, so I usually have a ball looking through the scrap bins. These pieces were rough around the edges, so I used a cabbing machine to trim and even out the sides of the smaller pieces, and then put all of them in a kiln to fire polish them. 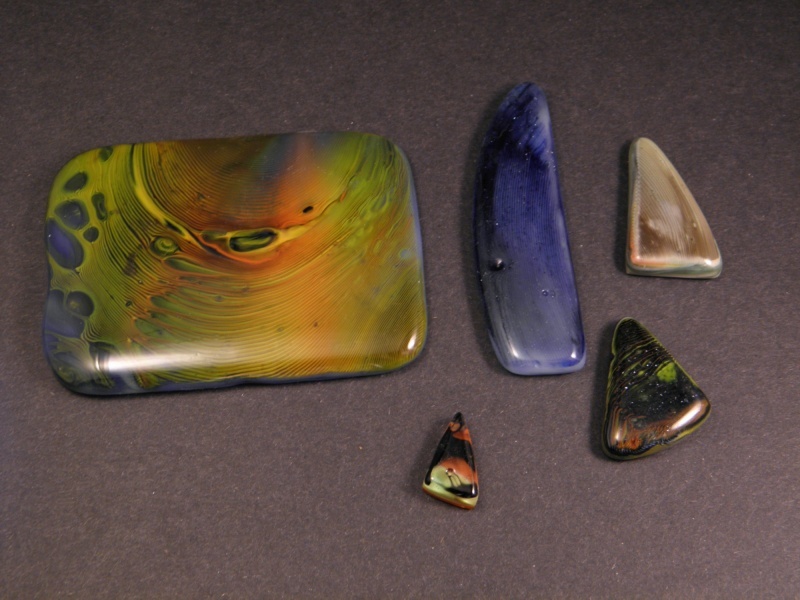 Fire polishing means you slowly heat the glass up in a kiln till the sharp edges melt and become more rounded, and then you let the glass cool down slowly. The smaller pieces, I will bezel set in sterling to make great pendants and the large piece, I will frame and hang on a wall. It's too big to be a piece of jewelry, and I rather not cut it down to size and lose the fabulous colorations and patterns. Sometimes it is a matter of knowing when to stop. I am pretty much done with classes, with the exception of one, for the year. My sewing machine has been calling me for 2 months, so I hope right after Christmas, I can go on a sewing spree. I have some coat ideas, using shrunken wool scarves and wraps to make a multi-color jacket. I also had a sweater I started knitting back in May 2010, and I am now just finishing it up. Taken too long! Now, if I can keep from losing my mind trying to keep up with the orders that are mostly due in the next few days, and then start on the Christmas gifts for my family. I'm starting to walk sideways due to exhaustion - not a pretty sight and endless entertainment for my mom.